Here’s a fact that might blow your mind – broccoli has 1.5 times as much vitamin C as a navel orange, gram for gram. Isn’t that amazing? It is also one of the most protein-rich vegetables, is high in fiber, calcium, iron, and vitamin K, and is chock full of phytochemicals and antioxidants. On top of all that, it contains compounds that are thought to protect against cancer. Having recently had a cancer scare, this last accolade was the most important to me. 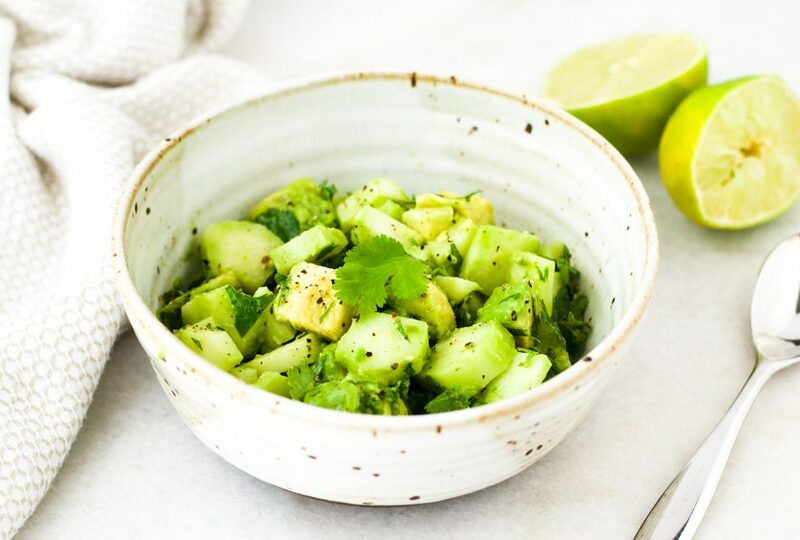 I immediately started working out ways to get more broccoli (and other cruciferous vegetables) into my diet, and I came up with this avocado broccoli stem salad. I don’t know about you, but I’ve been throwing away broccoli stems for years. I know it is a terrible waste, but I just didn’t know what to do with them. So when Imperfect Produce sent me this broccoli stem salad recipe by Almonds and Asana I was excited. I got straight into the kitchen to start experimenting. 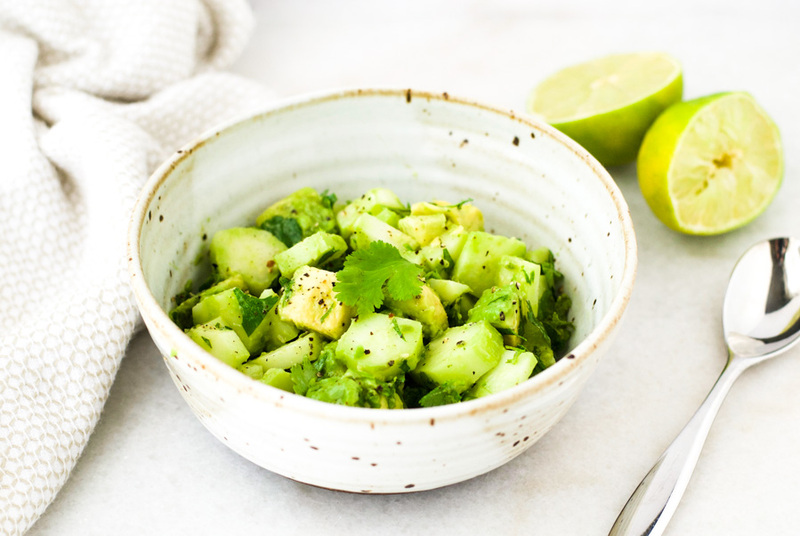 Inspired by that recipe, I combined broccoli stems and avocado with cilantro, fresh lime juice, apple cider vinegar, olive oil, and seasonings. The result was a deliciously crisp and refreshing salad that makes the perfect snack or side dish. One serving (half the recipe) contains 340% of your daily vitamin C, 25% of your daily fiber and potassium, and 16% of your daily iron needs. Not bad for a simple salad that can be thrown together in 10 minutes. I’d love some more broccoli stem recipe ideas. How do you prepare your broccoli stems? Please ket me know in the comments. Peel the tough outer layer from the broccoli stems. Slice the peeled stems into coins. 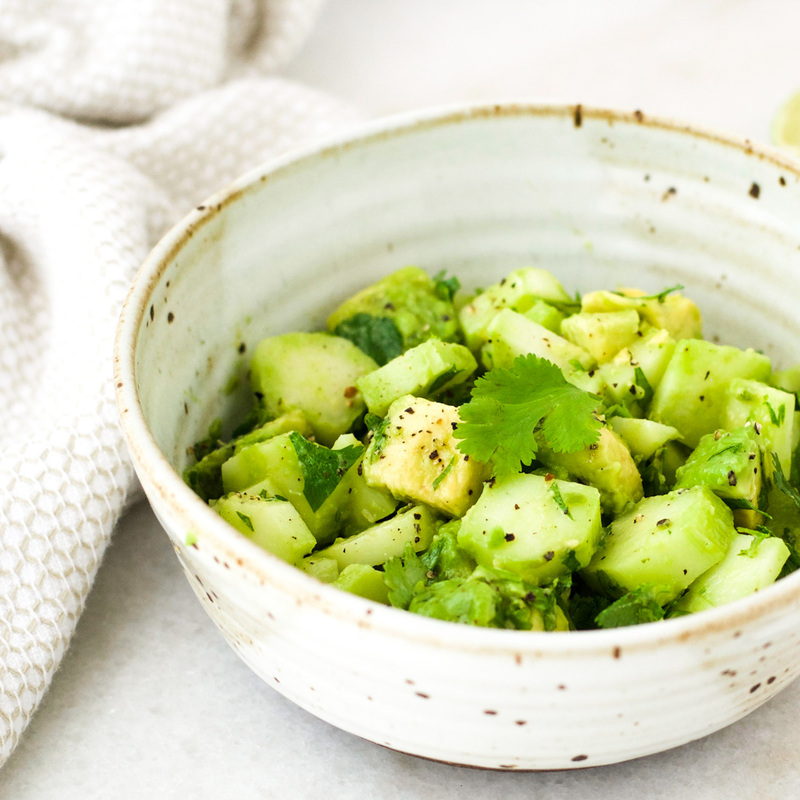 In a bowl, add the broccoli stems, avocado, chopped cilantro, lime juice, vinegar, oil, salt, pepper, and cayenne (if using). Gently stir the ingredients together being careful not to mash the avocado. mmm this sounds so good. I always feel bad tossing out those stems, now I know what to do with them. Hi, I love brocelli stems, even more than the florets. I juice them, steam them, stir fry, and eat them raw with hummus or as a brocelli slaw. No composting these babies for me, they are gold! Hi Katy. Thank you for your comment. I am SO excited to try all these ways to prepare broccoli stems. I think I prefer them to florets too. I can’t believe I’ve been missing out all these years. Nice recipe, will try this. For those of you who (like me) would rather not just throw the stems away, it’s a northern Italian thing to do this: peel the stems, slice them into coins, steam them until ALMOST done. THEN you toss a little olive oil in a saute pan, warm some sliced garlic and a pinch of red pepper flakes in the oil, then toss the steamed broccoli in to heat up and finish it off.